SafeRide connects you with an extensive network of health plans and care providers, letting you focus on what you do best: delivering rides to patients in need. Our free and easy-to-use tools support integration of ride volume from other sources, automate time-consuming processes, and make communication a breeze. Contact us to learn more today. Or give us a call at (855) 955-7433. Your privacy is our policy. We won't spam you, nor we will ever give your information away to another party. 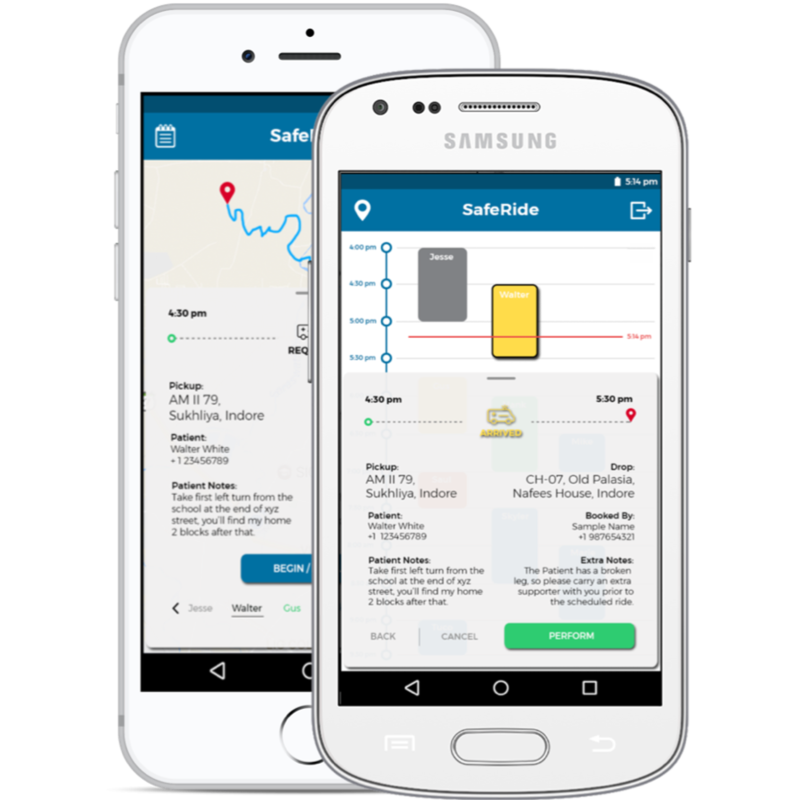 The SafeRide driver app - available for both iOS and Android - makes communicating with drivers a breeze. When rides are dispatched to a driver, they will receive in-app notifications that include all relevant patient information as well as an optimized route. Through the app, drivers can communicate directly with patients and care providers, allowing the parties to notify each other of any issues or special requests. Additionally, drivers can see schedule updates in real time through the app, allowing for a seamless sharing of information. SafeRide’s proprietary scheduling algorithm automatically optimizes ride schedules based on vehicle need, driver need, and location. Our on-demand “best fit” algorithm assures that on-demand rides are scheduled with minimal fleet disruption. Less time building schedules manually means you can spend more time fulfilling rides. Our technology suite includes dispatch and routing tools that are designed for efficiency. Rides are automatically dispatched to drivers in real-time, and include all relevant patient information to ensure a successful ride. Our routing software optimizes vehicle utilization by minimizing the time spent on the road with an empty vehicle. Fleet owners can monitor their vehicles in real time. Through GPS tracking in the driver app, you have visibility into where your vehicles are at all times, as well as the ability to track ride performance data. By gathering data around on-time rates, no-shows, and cancellations, you can maximize the efficiency of your fleet and increase vehicle utilization. SafeRide offers additional services to manage all compliance aspects of your operations. We work with you to ensure that all vehicles fit compliance standards set by payers, that all drivers are medically trained and qualified, and that all necessary paperwork is filed to operate in your region. We proactively address compliance issues by notifying you of upcoming expirations, qualification changes, and more. SafeRide trains your users how to utilize our tools to their maximum capabilities. We offer onsite as well as remote trainings, regular check-ins, and frequent product and feature updates. Wapato Shores Accessible Transportation strives to stay at the leading edge of technology available in the marketplace and have been impressed with the responsiveness of SafeRide’s Development Team. They have been responsive to our needs and have even gone to the incredible length of sending their entire team to Portland, Oregon to meet with our managers, dispatchers and schedulers, and our drivers to improve the product to better meet the needs of our industry.